While we were in Hawaii, there wasn't just diving. We also went snorkeling! We had heard a lot about Hanauma Bay, and arranged for a trip out there. Unfortunately the hurricane north of us had quite an affect on snorkeling. Here was our first view of the Bay. The surf was crazy! We heard the people manning the visitor's center comment that it was never like this. The waves out at the point were impressive. Unfortunately, the visibility in the bay was only a few feet with an incredible amount of stirred up silt. Also, the surge made snorkeling not a lot of fun. Instead, we hung up our snorkels and played in the surf, and laid on the beach. We also saw one of the mongoose that lived in the area, as well as some of the feral cats. Very cute! When we were leaving, this was a picture of what the bay should have looked more like. But we couldn't stay. 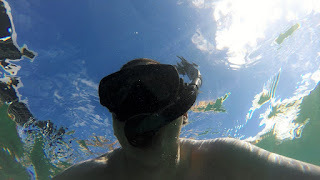 We had a lot more fun snorkeling on Waikiki Beach just out front of our hotel. There was a lot to see! We saw a scorpionfish, schools of reef fish, and some pretty nice coral. Look closely for the scorpionfish! The video that we got turned out pretty good too! It was too bad that Hanauma Bay wasn't the greatest, but puttering round in the shallows at the beach was almost as good.